There's a local legend in these parts as to the name of Tate's Hell State Park. It seems there was a rather unlucky farmer named Cebe Tate who had some cattle killed and run off by a panther. He set off into the forest in search of the cows and the panther, but got lost, was bitten by a snake/s and stumbled out of the woods a week later and collapsed. Before he died, he muttered the words, "My name is Cebe Tate, and I've been through hell. It's said that Tate's Hell State Forest was named after him. You can read about him here and here. I did say it was a legend. A few years ago I made some deviled eggs and called them Tate's Hell Eggs, and they tasted good, but the presentation wasn't that great. Well, I redid the recipe a little, and made some Tate's Hell Snake Eyes Deviled Eggs for Tapas last weekend. I shoulda made more, they disappeared, fast. As in, I looked there was a plateful, and then when I looked again, they were gone. Deviled Eggs are always popular and these are a take on my Tate's Hell Deviled Eggs. 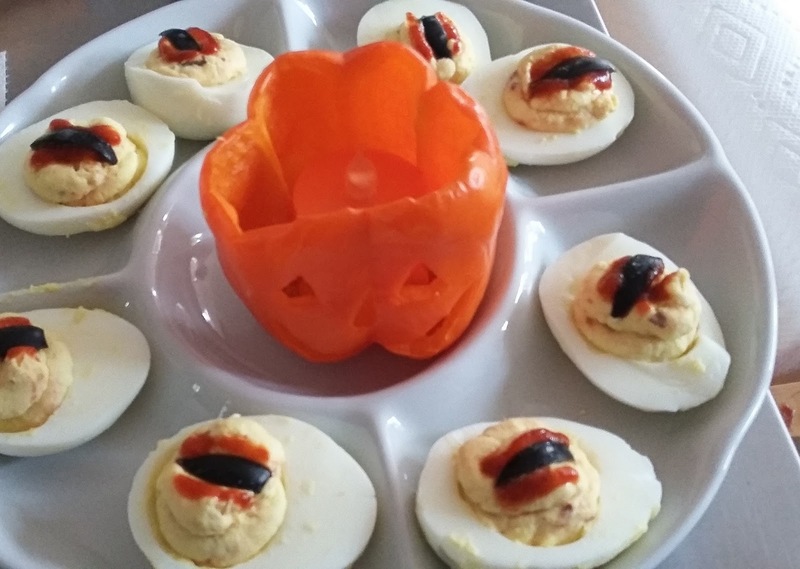 What a great idea for your delicious deviled eggs! Thanks so much for sharing your post with us at Full Plate Thursday! Have a great week and come back to see us real soon!